Chimney fires, lightning strikes and other traumas to the chimney can cause damage to the liner and, in some cases, to the masonry structure itself.Wood, coal and to a lesser degree, oil, fires combust fuel incompletely. The resultant smoke exits the chimney with these unburned particulates in suspension. As the smoke rises, it cools. When it reaches a certain temperature, condensation occurs and the particulates are deposited on the interior of the flue in the form of soot or creosote.Soot, from oil appliances, and creosote, from wood and coal appliances, are the chief culprits in chimney fires. Under the right conditions, these deposits will ignite, sometimes explosively, and burn at very hot temperatures.Terra cotta tile liners will withstand large amounts of heat, but not a rapid rise in temperature. If the rise is severe enough, the liner can crack and in some cases, even develop holes. While the chimney fire may be contained in the first instance, this damage needs to be repaired to be certain that fire protection and proper function are maintained.Lightning strikes can also be the cause of trauma to the chimney. Lightning may enter and exit at the top or travel all the way to the bottom. Again, a damaged tile liner needs to be repaired before the chimney can be considered safe for use.Earthquakes, downed trees and high wind are also documented causes of trauma to a chimney. 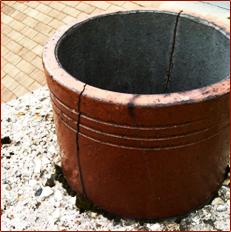 Call or email us to discuss a free consultation regarding the condition and repair of your chimney. The Raccoon going up and down a chimney flue can damage the flue cement between the flue tiles. This making the chimney unsafe to burn.Raccoon’s (mammals) have 60lbs of pressure per paw and push out and down to get up the chimney flue. This cause’s structural damage to in inner lining of the chimney called The Flue. The cement joining the flues together gets knocked out leaving unsafe gaps in the flue.This could cause a fire in the wall of your home Insurance will pay for the structure damage to your property under you Property loss Insurance policy.Notice: The black soot paw print from a Raccoon. Also the cement between the chimney flues is damaged and missing. Chimney Fires can cause the flue tile to crack in the fireplace chimney flue. The above picture is of a cracked chimney. Excessive heat from a chimney fire and thermal shock caused this structural damage to the chimney.Homeowners Insurance will cover this structural loss under the homeowners Fire & Causality Insurance policy.Pictures taken using a Level 2 WOHLER Visual Inspection Camera Chimney Fire damage to chimney flue Cracks leaving the chimney unsafe for wood burning.